This year I watched and read many retrospectives and obituaries for NASA’s Space Shuttle Orbiter programme, which had its final voyage in July. What these people don’t realise however is that the Space Shuttle Orbiters actually went nowhere near The Moon. In fact they barely escaped Earth’s atmosphere! The clue is in the name. An “Orbiter” does just that, it orbits Earth. Here’s a scale-model analogy that will help to put this into perspective. Imagine Earth is the size of a basketball and The Moon is the size of a tennis ball. This is a surprisingly accurate scale approximation since the diameter of The Moon is roughly 3.7 less than Earth. Using the same scale, the basketball and tennis ball would need to be 7.5 metres apart to represent the distance between Earth and The Moon. On the same scale how far away from Earth (basketball) do you think the Space Shuttle travelled on its voyages to the International Space Station? The answer is just 0.8cm. Yes, less than a centimetre. This is correct I assure you! 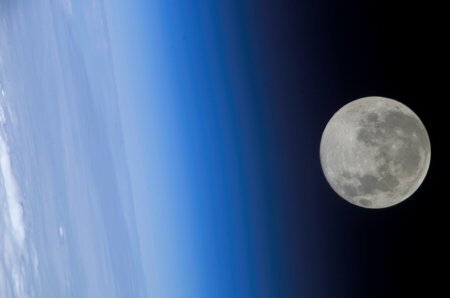 The distance between Earth and The Moon is roughly a thousand times further away than Earth and the ISS. So how useful was the Space Shuttle in furthering space exploration for mankind? This entry was posted in General and tagged Earth, ISS, Moon, Space Shuttle by djh. Bookmark the permalink.